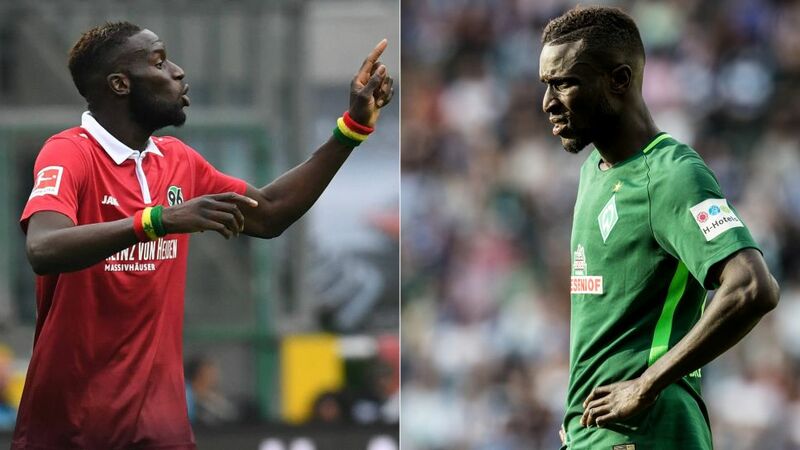 Sunday evening's clash at the Weser Stadium will be closely followed in the Sane household: for the first time in the Bundesliga, brothers Lamine and Salif Sane will face off when struggling Werder Bremen welcome high-flying Hannover 96. Both were born in France, both are central defenders standing at over six feet tall and - needless to say - both share a certain brotherly love. That said, any fond fraternal feelings will be put aside for 90 minutes on Sunday when their sides face off in a match that could have ramifications at both ends of the top-flight standings. At 30 years of age and standing six feet three inches tall, Lamine is at once both older and smaller than Salif. His Bremen side also find themselves in a much more precarious league position - 17th - than Salif's Hannover, sitting pretty in sixth. Indeed, Bremen are yet to win a game this season and require a pre-Christmas pick-me-up in the form of several three-point returns if they intend to remain clear of the relegation battle into the new year. For his part, Sane the elder has been a regular starter for Bremen since his arrival at the Weser Stadium from Bordeaux - where he had spent seven years - in summer 2016, and even though a flu has laid him low him recently, his coach Florian Kohfeldt said that there’s a "good chance" he will start against Hannover on Matchday 12. The new man in charge at Bremen, Kohfeldt has previously acknowledged Sane’s contribution to the the Green-White cause. "I value Lamine a lot, as both a player and as a person", said the skipper, who also commended his defender for his presence, strong heading game and being "the fastest defender" in the Bremen squad. While you'd expect two brothers who play professional football to have a more competitive relationship than most, Lamine is unusually deferential when claiming that Salif is the better player. No wonder, then, that he insisted in a recent interview that he would try to convince Salif to join him at the Weser Stadium. Despite his older brother’s attempts to lure him away, 27-year old Salif has stayed loyal to Hannover 96, where he has established himself as a key figure since his arrival in 2013. The recently promoted Lower Saxony side are on a roll, with impressive results in the first 11 games of the season, including a resounding 4-2 victory against Borussia Dortmund on Matchday 10. In no small part down to Sane's contributions, Hannover are currently level with Augsburg and Eintracht Frankfurt for third-best defence in the league, having only conceded 11 goals (Schalke have allowed 10; Bayern Munich eight). Having played every minute of every game - apart from the Matchday 1 win at Mainz, which he missed with suspension - Sane's influence in the 96ers' fine defensive returns is clear. Watch: Sane and Hannover shock Borussia Dortmund with a 4-2 win. Sane the younger's rock-solid defending has been instrumental in turning a team that started the season with moderate expectations into early contenders for European football. Standing at six feet five inches tall, the centre-back also recently helped Senegal qualify for the 2018 FIFA World Cup in Russia, although Lamine's retirement from international duty in 2015 will deny international football fans the chance to see an all-Sane Senegal centre-back pairing at next summer's tournament. Strangely, though, for two brothers who have both become professional footballers, Sane the younger insists that when they speak, they rarely discuss football. "I already do it for a living every day," said Salif, before admitting that he is relishing the chance to face his brother competitively again on Sunday. "We've already played against each other in France, but never before in Germany. I can’t wait." Click here for the Werder Bremen vs Hannover Match Centre!